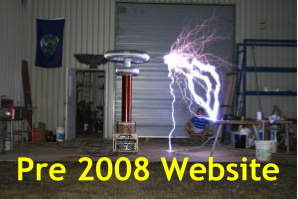 So I created my first webpage on the domain www.hot-streamer.com/hilo90mhz in 2000 or so the site was hosted for free by a tesla coil enthusiast named Terry Fritz. This allowed me to actually have an add free website for free without any bills to pay. Eventually Terry closed down his server that was running on his home internet line! A friend offered to host the site for me on his shared hosting plan www.hungrychild.org/hilo90mhz (thanks Drake!). That brings us to today, I have had my own server for 3 or 4 years now and am finally migrating the domain name over to it.. You can find the old website at www.historical.easybotics.com I will not try to duplicate that content here but keep it as is at that location.